A BIG THANK YOU goes out to Randy Farber for making his office available for this meeting. Another thank you goes out to Nancy Sellers for providing our monthly birthday cake. First:The Reunion Committee has provided a new updated class list. 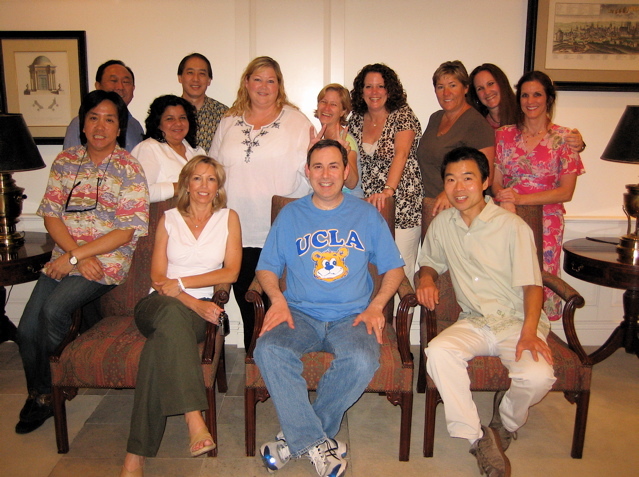 The class list was made available to the class reunion members for review via e-mail. Class reunion members were encouraged to make corrections or changes to this list. Second: After reunion picnic/brunch. Randy and Michael reported on possible sites for a picnic/brunch the morning/afternoon following the reunion. The class reunion members decided that a picnic would not be appropriate but a brunch at or near the hotel would be. Randy agreed to follow up and check with the Sheraton Universal’s hotel restaurant to see about a group brunch at the hotel. Third: Trivia Game: Debbie and Dona are working on the school/class trivia questions and answers for the trivia game cards to be placed on each of the tables at the reunion site. Fourth: Memorabilia: Tammy reports that the committee will look into a then and now poster and a military poster. Fifth: Gifts: Josie was unable to attend and her report was tabled. However, everyone was asked to seek gifts for the reunion raffle. Sixth: Awards: Nancy reports that she is working on the awards. The awards will be in the form of a certificate. Seventh: Slide Show: Dan reports that he needs more photos for the class slide show. The committee should be prepared to present a report during the next group meeting. 7:00 p.m. June 27th, Wednesday, at Maguire Aviation, 7155 Valjean Avenue, Van Nuys, CA 91406 (Van Nuys Airport). The business is located just south of the corner of Sherman Way and Valjean on Valjean. 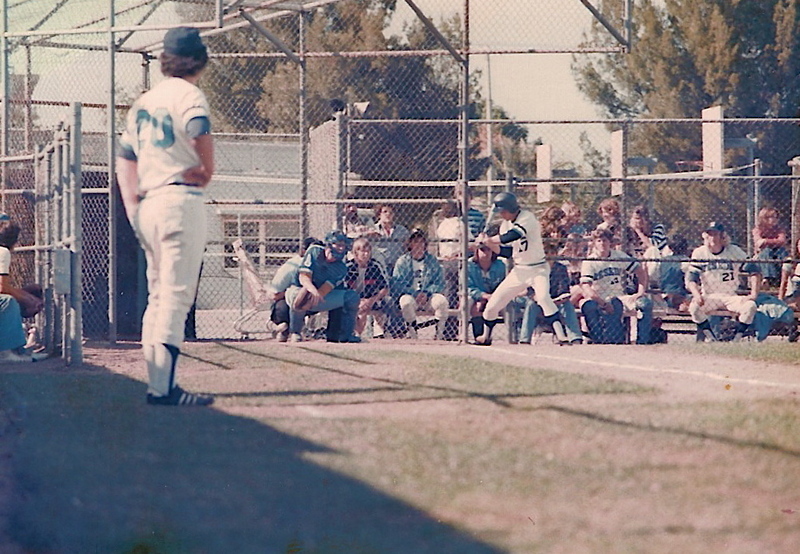 Kelly Faulkner batting, first base coach George Pons. 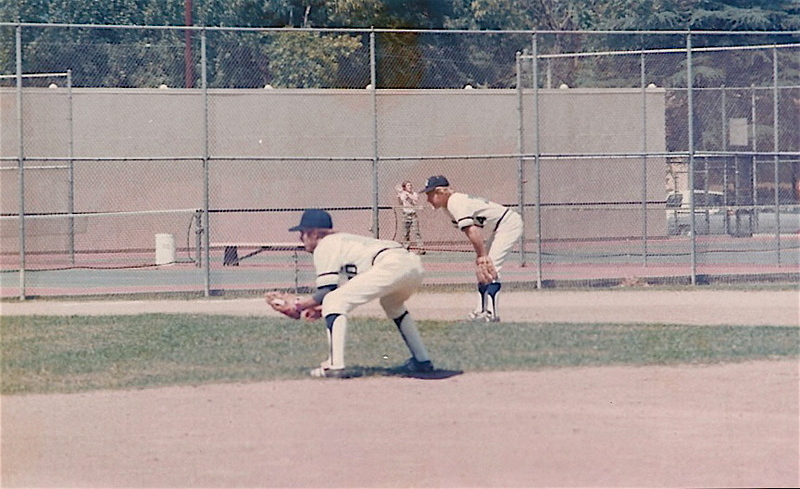 Foreground: Jeff Brooks playing second, Dave Bashara in the background at shortstop. Thank you Kelly Faulkner for the photos.